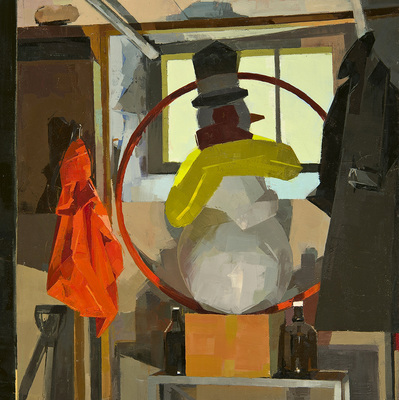 In Frosty (2013) – an oil painting done on a 12 x 12 inch panel – Catherine Kehoe depicts a plastic snowman balanced atop a cardboard box as if looking out a basement window. The box sits on a narrow table with a polished aluminum frame and legs. There are two large dark brown bottles, one on either side of the cardboard box. A red hula hoop frames the snowman in a perfect circle. And, like his brethren, he has a black top hat, red earmuffs, a pointy carrot-like nose, and a translucent, greenish-yellow inflatable ring for a scarf. Kehoe eschews rendering. She is an observational painter who puts together flat planes of paint. Frosty is comprised of abutted and overlaid planes whose color might change subtly, as it does between the cardboard box and “Frosty,” or it might shift suddenly from a red bundle to the brown wall behind it. The tension between surface and depth, solid and void, and the layer of paint and the spatiality it evokes, is tangible throughout Kehoe’s work. On another level, Frosty is an inventory of the essential geometric forms sought by Paul Cezanne in his own work – the cube, sphere, and cone or – in Kehoe’s case – the cardboard box, snowman and carrot nose. More than a century after Cezanne’s death, Kehoe has added a pentagon (top hat) and circle (hula hoop). They are all piled up, with lots of other things, in the basement. Encircled by the hula-hoop and inflatable ring, “Frosty” looks out the window, wondering if there is any place out there for him. Frosty can be read as an allegory of the contested space of painting. The painter must persist, like the snowman, even if it means hiding out in one’s basement. Kehoe works on a small scale, but her paintings do not feel small. Her paintings are no larger than 11 x 14 inches. The scale focuses our scrutiny, concentrating it on the highly circumscribed world directly before us. And yet, the visual complexity she achieves is one of the abiding pleasures of her work. This is what pulls me back to her paintings of a dusky pink coat hanging in a basement, intersecting a window, or peonies in a transparent glass between a pale green alabaster vase on the right and a copper-colored box on the left. The eye, directed by the palpable tension between the surface, its planes of paint, and the space carved out by three-dimensional objects, keeps undoing and refitting the planes and the forms made by the planes. There is a delight in the unveiling of the quotidian, in beholding what is directly in front of us. Looking, in Kehoe’s painting, is an act of scrutiny and devotion, an inquiry into the relationship between color and light, the solid and the transparent, and surface and reflection. She endows the ephemeral and the material with the same status – object and mirror image are equal. 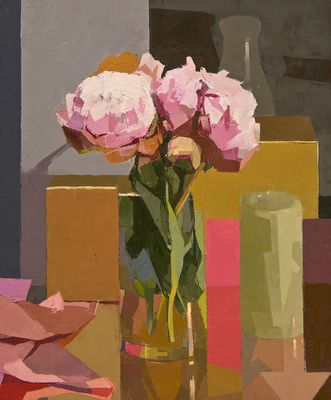 In Peonies (2013), Kehoe has stacked a red and pink plane between the green alabaster vase and the glass with peonies. Our perception keeps shifting between a box and two planes, volume and flatness. As our eye travels up the painting’s surface from the bottom edge, the color shifts from pink to copper to dark copper to gray, while the orientation of the planes moves further away and tilts back in space. Kehoe suffuses the dance between eye and mind with a pleasure at once physical and intellectual. I am enchanted by the different shades of pink, copper, green and gray, and by the interlocking planes that comprise the dusty green cylinder of the alabaster vase. The stacked planes behind the alabaster vase have the solidity of a castle wall. The copper-colored plane on the left becomes a monochromatic painting in a world brimming with color. Kehoe uses paint to construct her perception of things in light. In her still-life paintings she sets everything up, moves things around, removes and adds. The painting may take a month or more. The things in the painting break down into their abstract parts. Peonies is more than a still-life; it is a piece of visual music in which each colored shape has its own clarity. The range of green in the alabaster becomes a cluster of notes in a song — a distinct, inimitable solo. The muted greens offset the pinks, coppers, grays, and deeper greens and offer respite from the sharper, brighter colors. This carefully defined column of interlocking color elevates Peonies into the realm of heightened perception, transcending its genre to become a chromatic investigation of planes and volume, and solid and void. As in all of Kehoe’s work, the logic of the colors and their final configuration are internal to the painting. Essentially, the artist uses paint and brushstrokes to build a model of her perception of a thing. The perception can be complex, as in her still-life paintings, or it can be relatively direct, a matter of “pure perception,” which is how Kehoe characterizes her self-portraits and portraits. In these works, composition is of less importance. Kehoe’s interest is in the form (the head) and the surface. In contrast to the still life paintings, the portrait paintings can take an hour or two, and are done at the end of the day, after the artist has worked many hours in her studio. Many of these paintings are done on 6 x 6 inch panels. They are done under artificial light. The subject looks straight ahead, expressionless. On a literal level, her self-portraits turn her head into a form, the perception of which is constructed brushstroke by brushstroke, one color after another. There is humor in some of these works, as when she wears a man’s hat or a babushka. By breaking down the act of seeing into a series of brushstrokes, Kehoe arrives at a self-portrait that is both aloof and lacking any trace of sentimentality. There is something haunted and vulnerable about them. In these bodies of work, Kehoe makes no concession to current styles and preoccupations. She carves out a space for herself, and then occupies it with dignity and joy, exactitude and sensuality; the gracefulness she achieves is all her own. John Yau is a poet and critic whose latest books include Further Adventures in Monochrome (Copper Canyon, 2012) and A Thing Among Things: The Art of Jasper Johns (DAP, 2008).